Z-wave is a wireless technology uniquely suited for home automation devices. Operating at a lower frequency (about 900 MHz) than Wi-Fi or Bluetooth (about 2.5 GHz), Z-wave frequencies are less likely to to be interrupted by other devices running at the same time, giving you smooth, continuous coverage and hands-free control over your home. 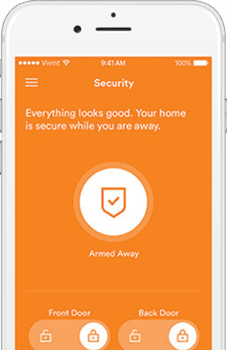 How Does Z-Wave Work with Vivint? Z-wave functions by linking compatible devices via a centralized hub. The Vivint SkyControl™ panel acts as this Z-wave “mothership,” connecting your Vivint-compatible Z-wave devices for unparalleled control over your household. Once your home automation devices are synced to SkyControl, you can tweak settings from anywhere via the Vivint Sky™ app. Z-wave smart thermostats—like Vivint’s Element™ Thermostat—use a reliable Z-wave frequency to learn from your daily routine and adapt to your lifestyle. Using Z-wave technology, advanced features like smart door locks and the Z-wave Doorbell Camera work to provide greater security over your home. With Z-wave enabled lighting, you can switch your lights on or off from almost anywhere through the mobile device already in your pocket. Imagine getting home from work and your thermostat automatically turns up the heat a couple degrees as you settle in to watch a movie. Through the power of Z-wave technology, smart thermostats like the Vivint Element Thermostat study your daily temperature adjustments and adapt settings to your routine for increased energy savings and a lower monthly bill. Z-wave wireless technology gives you the best bet at a consistent climate in your home. Since Z-wave smart thermostats use a low wireless frequency, devices using Wi-Fi won’t interfere. That means you’ll experience less interruptions in service and more reliable comfort in your household. 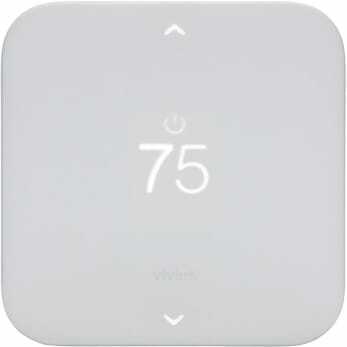 Vivint Element Thermostat Not all smart thermostats are created equal. Unlike Nest Learning Thermostat and the EcoBee3, which use the same Wi-Fi signal as the majority of your other devices and can easily overwhelm slower connections, The Element Thermostat uses the efficient Z-Wave frequency, dedicated exclusively for use by home automation devices. Add a first line of defense to your home, and boost the security of key entry points, with smart door locks. Worried you might have forgotten to lock the front door in the hubbub of the family’s morning routine? With smart door locks, you can lock your doors from afar, so you always have a handle on the security of your entrances. Always losing your keys? You won’t have to rummage through coat pockets before an important meeting anymore with Vivint’s Keyless Doorlock. A Z-wave-enabled device, the Keyless Doorlock can lock or unlock your door remotely and deter criminals from trying to pick the lock, increasing the security of your home. Your smartphone can double as a remote for your garage door no matter where you are. With a Z-wave garage door opener, you can let your neighbor in to use the car while you’re on vacation, or close the door behind you when you leave for an afternoon jog. Manage your lights from your phone or program them to fit your lifestyle with Vivint’s line of Z-wave-compatible lighting control devices. You’ll get effortless control of your energy use and help bolster your home’s security and automation. Simply swap out regular lights and features for their Z-wave-enabled counterparts, and you can lower your risk for theft while enjoying a newfound efficiency in your daily routine. Want your lights turned off and doors locked before bed? Simply ask Alexa, and she’ll get it taken care of. Amazon Echo’s “Alexa” uses Wi-Fi to communicate with the Vivint SkyControl™ panel. 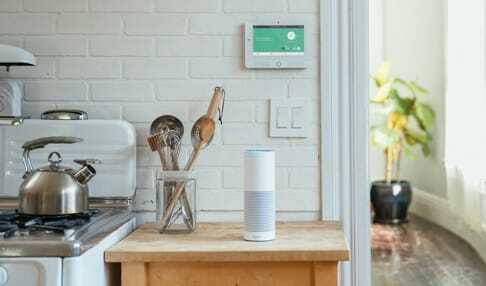 SkyControl then converts the signal to Z-wave, allowing Alexa’s voice-activated technology to control every Z-wave-enabled device in your Vivint Smart Home. Whether you want to double check that you shut the garage door after you’re already 10 minutes away, or turn up the heat a few degrees while you’re at work so it’s toasty when the family gets home, Z-wave devices and technology give you the peace of mind of home security while offering the luxury of automation. Everyone has different needs and preferences. Simply fill out the form, and a smarthome specialist will give you a call to discuss pricing and the best Z-wave options for your household. Or call 1-877-519-5530 today for a more instant connection.